This box set includes the standard album "Imperium" in digipak, "Music Sacra" in handnumbered & sealed cardboard slipcase, a postcard, a sticker and a black painted spica. The box is made of study cardboard, wax sealed and handnumbered to 200 copies. CD comes in white velvet digipak with embossed letters, incl. a postcard and booklet. Limited edition of 88 handnumbered and signed copies. The first 33 copies are coming with a cement skull as special art edition. Tracks 3,4,10 previously released on "... Über Liebe, Leben Und Tod ..." CD. Tracks 5 & 6 previously released on "Gloria" CD. Tracks 3-7 are re-recorded acoustic versions. Recorded between April 2014 and January 2015. 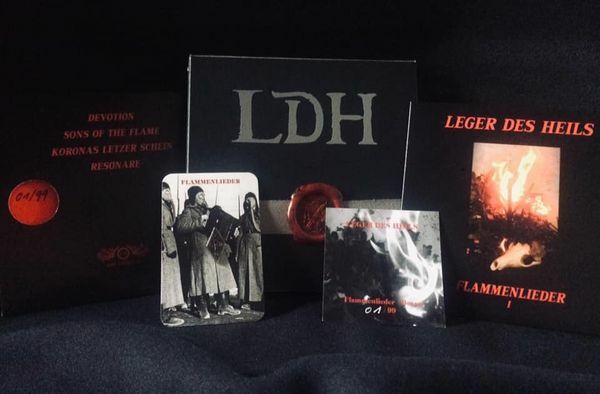 On December 21, 2018 the first part of the LEGER DES HEILS trilogy FLAMMENLIEDER (Songs of flames) was published. It was produced as mini-cd, presented in a handmade, lavish and ornate box. In following years (2020/21), the two remaining parts will complete the trilogy. The box set includes, next to the mcd FLAMMENLIEDER, a few extras, like a metal torch-pin, torch-sticker ... The Edition is strictly limited to 99 copies. трек посвящён актрисе театра и кино Сибилле Шмиц. Более подробно можно прочесть в википедии о её трагической судьбе. PsychologischeMobilmachun, огромная благодарность.не спрашиваю как удалось достать,спрошу только о флаке.случаем не богаты? sonnenatale, you want it into in a FLAC file?